You may feel like you just collided with a stop sign. You freeze, not knowing what to do or what to say next. To assist you on practicing the proper pet etiquette around service dogs, we talked to Jennifer Arnold, co-founder of Canine Assistants, based in Milton, Ga. Arnold, who has trained more than 1,000 service dogs at Canine Assistants, has come up with a novel way to satisfy pet lovers who spot one of her trained service dogs. 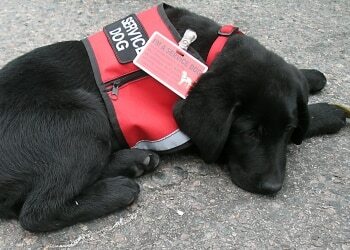 “About six months ago, I replaced the patches on our service dogs that read, ‘Don’t pet me. I’m working’ with the new message: ‘Ask to pet me. I’m friendly.’ The reason? Our service dogs are friendly and part of what I think helps our clients as well as people in the community is when they are allowed to interact in a positive way with the service dogs,” Arnold explained to us. 1. Never run up and pet a service dog without permission. You may startle the dog and his person, who may fall and get injured. 2. Always connect first with the person with the service dog. Introduce yourself and exchange greetings. Then, ask if you can pet the service dog. 3. Avoid staring at the dog and the person. It’s rude and can make the person and the dog feel uncomfortable. 1. Always heed the handler’s instructions when interacting with a service dog. Wait for the person to give the dog a special cue that alerts the dog that he is temporarily “off duty” and available to be approached. 2. Ask specific questions about how the dog is trained and about the partnership between the handler and the dog. Do not invade a person’s privacy by questing why he needs a service dog. 3. Never give a treat to a service dog without permission. These dogs are often on specific diets that keeps them at healthy weights. Read a story about service dog, Gander, who was rescued from a kill shelter and now works with a Vietnam veteran to help with his PTSD, anxiety, and autoimmune arthritis.